Space can be a real challenge when living in towns and cities. The chances of finding a property with a generous outdoor area are slim, so just like architects; gardeners have thought vertically. 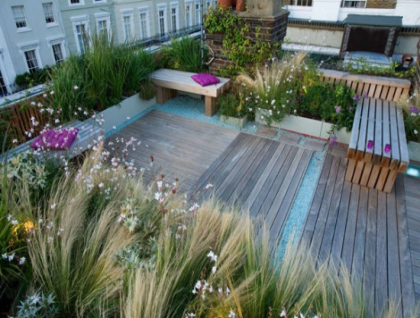 Roof gardens are real challenges to designers, when trying to create usable outdoor spaces in small areas, with a number of limitations and few of the traditional natural prompts you find in a true garden. So when you find one that’s been executed well, it sticks in the memory as a true inspiration. Of course, open and spacious is exactly what most roof gardens aren’t. These two words, therefore, should be the principle of designing a successful roof garden. Instead of parapet walls, utilise transparent borders. Instead of block hedging, use spaced verticals. Don’t plant too close together, don’t hem the garden in all around. Compact, cosy spots are to be welcomed, but the overall plan should be open and spacious. Well, there isn’t really a vertical limit; but you get the idea. Think upwards. 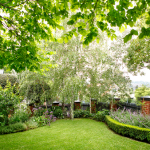 Think tall plants and trees, or bamboos and grasses if you’re keen on low maintenance. It will draw the eye skyward, rather than to the relatively confined surroundings. 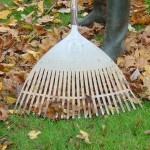 These will also help to maximise the greenery of the setting. And don’t forget to use the existing vertical spaces, hanging planters on walls and railings, and using climbers. Lighting can be one of the most important features of a roof garden. Focus on lighting particular spots, creating countries without borders on a small roof, and don’t forget to light doorways and staircases to create natural paths and routes with light. Uplights are popular, but remember that you often won’t get the bounce back you get from interior ceilings. The more effective your lighting, the larger your roof will look after dark. In honour of keeping it simple, you should try and stick to three colours in your roof garden design. Choose an accent colour, and one or two complementaries. 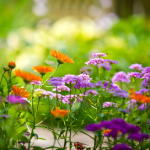 Think about choosing an accent colour that complements your planting style, and then choose the others to contrast and create differentials. Roof gardens have been some of our most challenging projects to date, and just like in small garden design; the forced discipline often breeds innovation. Always fun, always challenging, always rewarding. Don’t write off your outdoor space, no matter how small or high up, just because of limited space.